Life on the Line: Season 3 - BUY THIS DVD! The desire to overcome is at the core of everyone. Especially those fighting disease, facing a natural disaster or coping with a disability. 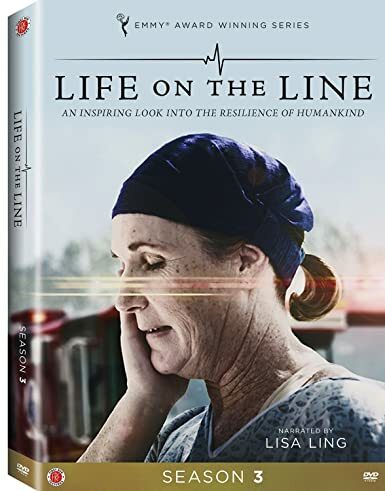 Life on the Line is an Emmy Award-winning series narrated by Lisa Ling that follows the medical journey of individuals fighting for their life. At hospitals around the nation, people face life and death situations every day. Life on the Line zeroes in on one renowned academic hospital in Southern California. Loma Linda University Health serves one quarter of California and equips medical teams to travel around the world. From surviving Ebola in Western Africa to healing after one of the deadliest terrorist attacks on US soil, Life on the Line is an inspiring look into the resilience of humankind. THEN SEND IN A COMMENT ABOUT YOUR FAVORITE FUNIMATION TITLE (you may click on artwork above for a refresher) PLUS YOUR NAME AND ADDRESS TO contests@efilmcritic.com or WeLoveHBS@aol.com. (Just one e-mail please.) Put [b]"EVERY DAY ON THE LINE" in the subject line and cross your fingers. We will draw names and one of the prizes could be yours. Only 1 entry per household.